Russ Ricketts is an incredible underwater photographer/videographer living in Leavenworth, WA. He runs River Snorkeling as well as Colchuck Media with his wife, outdoor adventure and lifestyle photographer Leah Hemberry Ricketts. There's nobody better to snorkel a river with than Russ. I know this because he took a leap of faith to meet me after the last chunks of the Elwha's dams were removed. I wanted to get in the freshly free-flowing river to shoot, but the conditions told me that I shouldn't do it alone. All sorts of debris from the dam removal was moving downstream and the water was murky. Russ was on board to jump in with me and he'll be a friend for life because of it. It was easy for us to find chunks of concrete from the dam. I cheered every time I saw one. 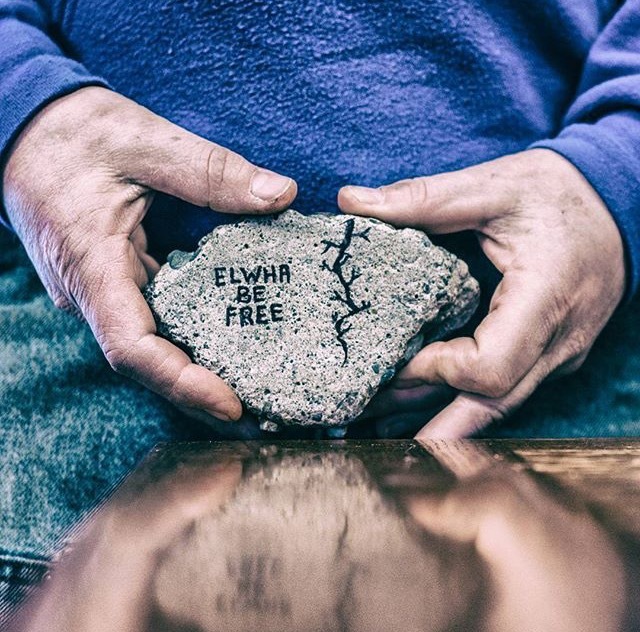 Inspired by Mikal Jakubal, the activist who painted the crack and "Elwha be free" on the Elwha Dam in 1987, Russ painted one of the pieces he found. I never thought I'd have so much love for a piece of concrete. Thank you, Russ! Photo (left): Russ Ricketts. Photo (right): Mikal Jakubal.